Benchmarking is a vital tool within logistics, though its relevance to the transport sector has been limited by the variables of distance, drop size, location and route to market, which makes it hard to provide an apples-with-apples comparison. Simply Supply Chain developed a benchmarking tool to provide logistics directors with commercial and operational insight that they can actually use and act upon, to improve their performance and cost-effectiveness.
. How opening discussion with providers ensures a truly competitive service. By comparing your unique activity profile against the standard and we can use the result to compare you anonymously with your peers and other 3PL solutions. By using true like-for-like comparisons we overcome the previous limitations of transport benchmarking and give you real insight to target realisable results. 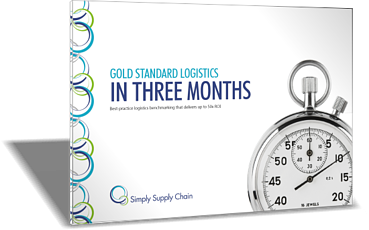 The Gold Standard Index (GSI™) has saved millions for suppliers already to date. With two thirds of last 100 benchmarks clients achieving savings of between 15 and 50%. For the full information on our benchmarking process download our ebook by filling the form below, or contact us for advice.